The cruise ship was carrying a group of 8th grade students on a class trip from the Day Middle School in Newton at the time. 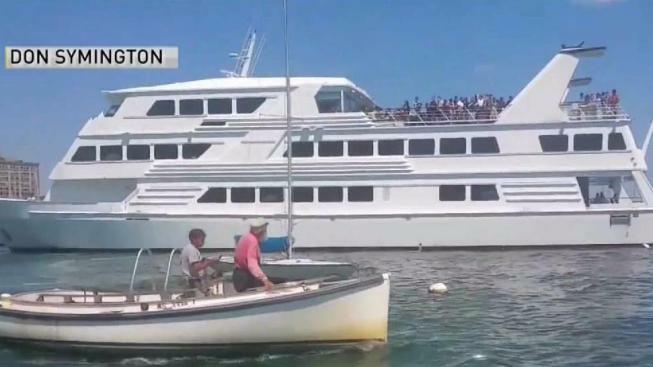 The U.S. Coast Guard continues to investigate how a Boston Harbor cruise ship carrying more than 300 passengers hit several moored sailboats off Rowe's Wharf on Thursday, while the crew works to resume service. The U.S. Coast Guard is investigating after a cruise vessel carrying 326 people hit six moored sailboats in Boston Harbor on Thursday morning. The Odyssey was carrying a group of 8th grade students on a class trip from the Day Middle School in Newton at the time. After about an hour of waiting for parents to come by, students like Indi Cha were finally let off the ship. Her mom is relieved no one was hurt. "Honestly it was a beautiful day and that's all that matters," she said. Cha and her classmates say they're a little upset about the way their end-of-the-year excursion on the water is coming to an end. "A little disappointing but that's okay." The boats were hit around 11 a.m., according to Coast Guard officials. Authorities say The Odyssey temporarily lost power while leaving the pier at Rowes Wharf and drifted backward into six moored sailboats. The boats suffered only minor damage - mostly scratches. Another vessel was able to tow the Odyssey and moor the vessel to safely get passengers off board. Odyssey Boston says a faulty part caused the engine failure. They released a statement that says in part, "The company has an exemplary record serving millions of guests in over 30 years cruising Boston Harbor." Aerial footage from NBC10 Boston's Sky Ranger helicopter showed people gathered on the upper deck of the ship and what appeared to be Coast Guard personnel on board the back of the boat. According to its website, Odyssey offers cruises departing from Rowes Wharf along Boston Harbor from Castle Island to George's Island, east to the Boston Light on Little Brewster Island and back to the Charlestown Naval Yard before returning to the wharf. It also offers group events for school field trips. The Coast Guard said the investigation into the cause of the failure is pending. Alcohol testing of the operator was completed on site. A spokesperson for The Odyssey says they are trying to get back on schedule by Friday morning.